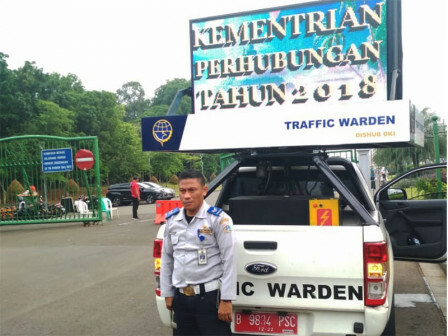 As many as 2,500 officers of Jakarta Transportation Dept. are prepared to manage traffic flow during Christmas and New Year holidays.
" We'll do traffic mitigation in Monas, Ancol, Kota Tua, TMR, TMII, Setu Babakan Betawi Village, Lapangan Banteng, TIM, and Tugu Proklamasi areas"
Jakarta Transportation Dept. Acting Head, Sigit Wijatmoko stated that those officers will be spread to nine tourist destinations and crowded areas. "We'll do traffic mitigation in Monas, Ancol, Kota Tua, TMR, TMII, Setu Babakan Betawi Village, Lapangan Banteng, TIM, and Tugu Proklamasi areas," he expressed, Saturday (12/22). His dept. has coordinated with the owner and management of building around the tourist area to facilitate additional parking lots. He also urges people who want to go to tourist places not to use private vehicle. "Hopefully people prefer to use public transportation to prevent traffic jam. We'll do socialization intensively soon," he stressed. During New Year celebration, ambulances will be alerted in 22 strategic points and crowded areas in five cities. "Tow car and vehicle message sign will also be alerted. We'll work optimally by sending picket officers and setting up posts at levels of dept. and sub-dept., terminal technical management, SPLL technical management for 24 hours," he told. Parking lot is available in the basement I and II, on yard of Amir Hamzah Mosque, and yard of ex-TPS 240. C) Zona 3, light vehicle can park in Keprajuritan Museum, Dunia Air Tawar, Taman Burung, Iptek, and At-Tin Mosque.